Securing reflectors, gel filters, negatives, prints, fabric, etc., doesn't get any simpler than with this age-old, natural solution. Also great for use as clips for drying film and prints in your darkroom. Package of 50 wooden, spring clothes pins. Box Dimensions (LxWxH) 6.2 x 6.15 x 1.8"
Clothes Pins is rated 3.7 out of 5 by 43. Rated 2 out of 5 by NrgDani from Not Great I bought these for securing gels and defusers onto professional lighting equipment. I did not like it because the pins are smaller than they look and the construction is poor. Some pins snapped out of my fingers when clipping and broke. Perhaps it would work well enough to hang prints and negatives to dry, since those are very light. For gels, diffusers, cloth, etc, which are a bit heavier, I would not recommend. As an example, you would not be able to hang jeans to dry with these. My comment is that you get what you paid for... these were inexpensive and that is what I got as far as quality. Rated 5 out of 5 by Dooglas from Phenomenal Product With this product, General Brand has done a phenomenal job of creating a clothespin/C-47 that is not only rugged, functional and durable, but sold at a price that won't break the bank for everyday folks. Long gone are the days of overpriced C-47s reserved only for professionals shooting large scale productions. Now the everyday consumer can use the same C-47 that the pros are using on their own productions, opening the market to new artists with refreshing creative ideas. Sure, the pros probably aren't happy that Average Joe has much better camera, audio, color correction, editing, and now, C-47, resources than in the past, but as Bob Dylan said, The Times They are A-Changin, and perhaps that's more true nowadays than ever before. I've been using these C-47's fairly heavily for the past two months, and overall, they've been perfect. Apart from the scuffs and scratches of everyday use, the products haven't lost any spring strength and still keep hold well on relatively heavy applications. I'll obviously have to monitor their condition over the next year or two, but considering the great price, it wouldn't be a big deal at all to get more if some start to fail. However, kudos to General Brand's craftsmanship-- I don't see that happening anytime soon. 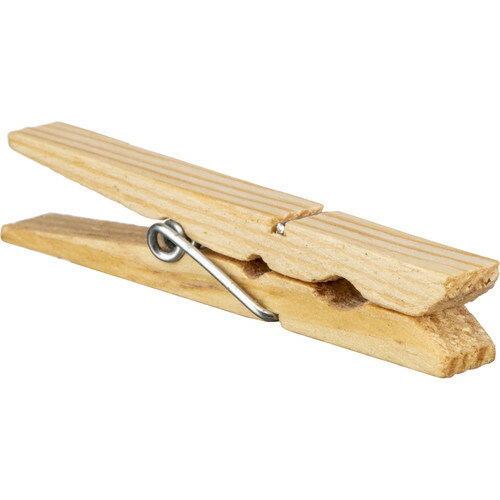 Rated 2 out of 5 by Thomas from Not heavy duty These clothes pin are not the heavy duty type. They are average and come apart easily. Rated 5 out of 5 by Anonymous from Can't say enough... These clothes pins are amazing! While other stores sell them, I found myself very, very happy with these. They show up on time, work really hard holding gels and diffusion, and don't ask when they will be paid. I would certainly recommend them for any other pro out there. And, the color is tack on. Not to light, not too dark. Don't shop around, get these!!! Rated 3 out of 5 by Rosegold Creative from For Pinning Stuff Not all C47s are created equal. And these ones are certainly less equal. But as C47s, you just throw them away after they have broken during the first use. They're so cheap they're practically free. At least they come in a pack of 50. Also, it doesn't matter where you get them, they are all made poorly. Rated 5 out of 5 by Matt the Videographer from Works as Advertised What can you really say about clothes pins (C47s)? I prefer wood because it's durable and doesn't heat up. I use this for lighting and various other things. These works great for me. Rated 3 out of 5 by Meltronic from Needs more clipping power These C-47s lack the clipping power I'd expect from a decent clip. They feel like they'll break pretty soon. At least there are 50 of them. Rated 5 out of 5 by Anonymous from blap blap blap you think know clothes pins? you don't know nothin until you tried these by GENERAL BRAND. GENERAL. BRAND. that's just the name of a quality company. no doubt. General Brand. aw yeah. clip these on anythang and that thang be secured, ya hear? gels, silks, draws, silk draws. your only limit is yo mind, yo magination so let it run free and wild like a crotch rocket on the auto bon. it took 47 tries to get this right but boy did they ever. c47 in the howse! I see complaints about being too small. What is the length?